I saw some great things on the ice from some players on both sides. 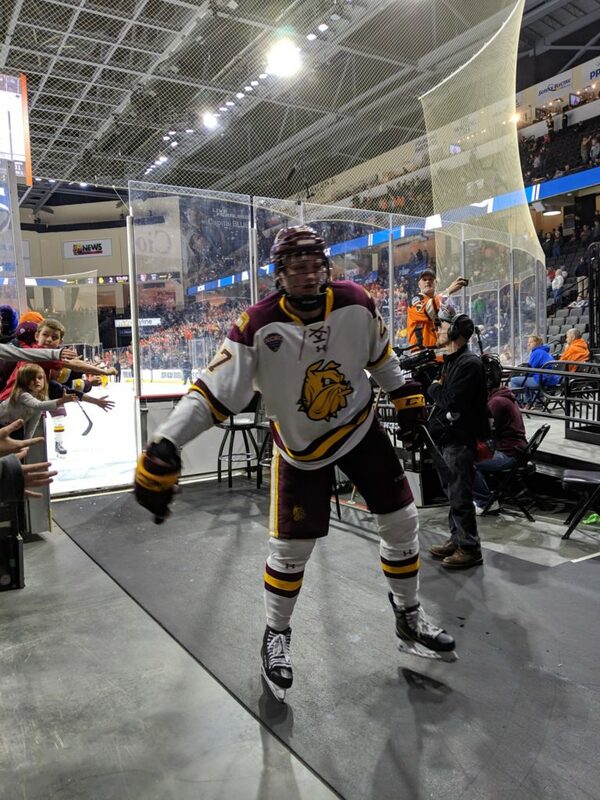 Ryle Tufte – Dallas draft pick – 6-6, 230 – LW – Early on he looked a bit slow. Not fully engaged and his passing was off. As the game rolled on, he got better, and he was really good in the overtime. He played a heavy game. He used his body. He had a nice turnaround shot off the wall that could have gone in. He played best when the game was on the line. Scott Perunovich – Blues pick – 5-10, 175 – RD – He plays a lot of minutes and important, pressure-packed shifts. His work from the point is great. His skating is terrific. He has a lot of confidence. I’ve talked about him being one of the best defenseman in the country all year long and he really is. He can turn pro anytime he wants to. Cole Koepke – Tampa pick – 6-1, 195 – LW – He assisted on the winning goal after having a great shot attempt of his own in OT. He’s always around the puck. He has a lot of upside. Justin Richards – Undrafted – 5-11, 190 – C – He won 15 of 31 in the face-off circle. As a sophomore, he played with confidence. He has great drive to the net. Keeps his feet moving. He got the puck to the net on the eventual game-winner. An unheralded play. He’s 21. Ryan Bednard – Panthers draft pick – 6-5, 200 – G – He’s very active and has a fast glove. He has long arms to trap pucks far from the net and he covers up quickly. He had good pokes to guide the puck to his defenseman. The game-tying goal wasn’t his best puck awareness of the night but he had a very solid game. Brandon Kruse – Vegas draft pick – 5-9, 155 – RW – He’s very good at holding on to the puck. He can cycle it with the best of them at this level. Made some pretty passes from the slot area. Tim Theocharidis – Undrafted – 6-1, 183 – D – Freshman at 20, he played the third pairing but showed a lot of offensive prowess. He has a solid wrist shot. He was very good at puck retrieval. His offensive zone reads were very good. He has some upside.